Ivy was blessed to have her loved ones by her side when she passed away in the early-morning hours on Wednesday September 26, 2018 at the Frances Mahon Deaconess Hospital in Glasgow, MT. 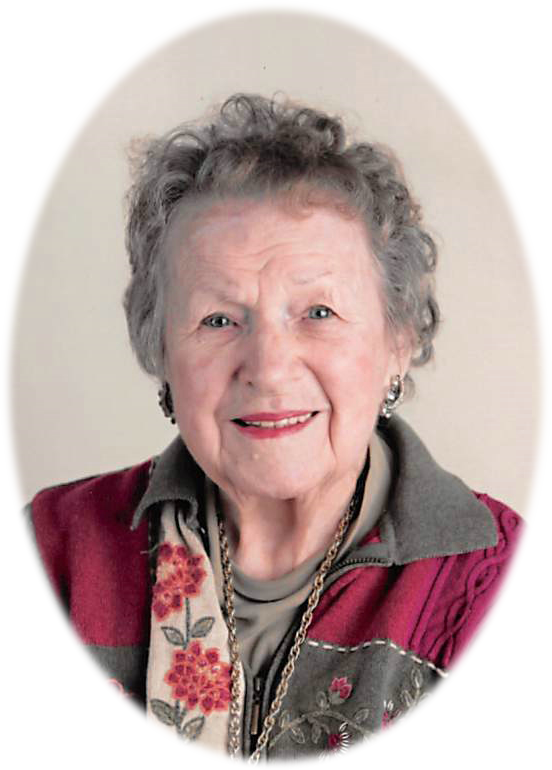 Ivy was born on April 3, 1931 in Fergus Falls, MN to Martin and Hattie (Northup) McNulty. In the spring of 1934 Ivy’s mother, Ivy, and most of her siblings, along with their two-family dogs, and all their belongings crammed into a 1929 Dodge to travel to the Fort Peck Dam project in northeastern Montana. There they joined their father, Martin McNulty, who had begun working on the Fort Peck Dam project in October of 1933. He was one of the first people hired to clear the land on the Missouri River bottom. In later years Ivy’s mom told her that all they could see when reaching the boom town of Wheeler, was a “sea of tar-paper shacks”, with one of them to become their home. The first winter in their tar-paper shack the temperatures dipped to -35 to -40 below zero. The following year Ivy’s dad purchased a 24-foot by 24-foot home for $300. It came with logs whitewashed inside and out and even had linoleum on the floor. “Although it wasn’t a mansion, the new house seemed like one to us,” Ivy once wrote. While growing up in The Great Depression of the 1930’s, Ivy made the most of things, displaying an entrepreneurial spirit lasting most of her life. By age 5 in Wheeler, Ivy was making wildflower bouquets and selling them to neighbors for 5 cents. She collected pop and beer bottles and redeemed them for coinage. Believe it or not Ivy even collected rocks and polished them, selling the pretty ones for 5 cents each. Ivy moved to Glasgow at age 13 and eventually attended Glasgow High School. She worked for 7 years as a fountain girl at Al’s Cafe. Her can-do attitude would later turn into a lengthy career of selling cosmetics, owning and operating the Unique Shoppe and Ivy’s Gingerbread Crafts in Glasgow, where she would sell her many homemade crafts. Later in life Ivy purchased and operated the Buckhorn Lodge in Wheeler, MT where her childhood roots began. On March 29, 1953 Ivy married Frank W. Stebleton. Frank was employed for nearly 40 years by the Great Northern and the BNSF Railroads. Together they raised their five children in the Glasgow community. In the 1980’s Ivy was the driving force behind creating the farmers market at the Red Rock Plaza. This was one of Ivy’s proudest accomplishments. It was here that Ivy began selling her delicious homemade pies and crafts. Ivy loved baking and cooking; homemade Italian raviolis were her specialty! She was also extremely creative when it came to arts and crafts. Ivy had a heart for animals but a real soft spot for cats. In her later years Ivy enjoyed watching Turner Classic movies, especially John Wayne westerns. Musically she liked the big-band sound of the late 1930’s and 40’s with Glen Miller but Elvis was her all-time favorite musician. In 2012 Ivy was interviewed for the Montana PBS documentary titled, “Fort Peck Dam”, where she shared her experiences of growing up in the boom town of Wheeler during the construction of the Dam. This film can still be seen today on the Montana PBS channel. Miss Ivy’s greatest joy and accomplishment was the time and love that she spent investing in the lives of her children, grand-children, extended family, and her friends within the community. She is survived by: a daughter Diane (Jim) Brandt; four sons, Joe Stebleton, Steve (Mary) Stebleton, Mike Stebleton, and Doug Stebleton; four grandchildren, Matt (Amanda) Brandt, Dan Brandt, Angela (Rapheal) Gavin, and Jeremy Stebleton; and three great-grandchildren, Blaine Brandt, Jacob Brandt, and Xavi Gavin. Ivy was preceded in death by: her parents Martin and Hattie McNulty; four sisters, Claryce, Dorothy, Irene, and Margaret; four brothers, Bud, Don, George, and Joe; and her husband Frank Stebleton. Ivy had a love for life, color, laughter, music, and dancing and now because of her faith in Jesus Christ, she is dancing with her Lord. Memorials in honor of Ivy can be sent to the Fort Peck Summer Theater, Valley View Home, and The Pioneer Museum. Remembering our dear neighbor, Ivy Stebleton. What a wonderful life she lived, and what a wonderful gift she was to her friends, her family, and her community. Our prayers are with those she left behind – she will be missed by us all! Very nice sweet lady. I will never forget her. Ivy was such a wonderful lady! So sorry for your loss.